This is a sponsored post written by me on behalf of Bakery Crafts for IZEA. All opinions are 100% mine. 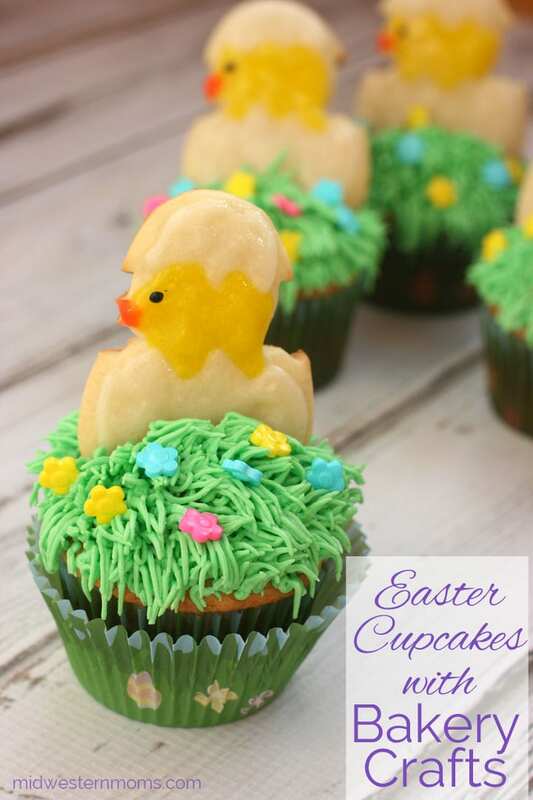 Fun cupcakes that are perfect for Easter! 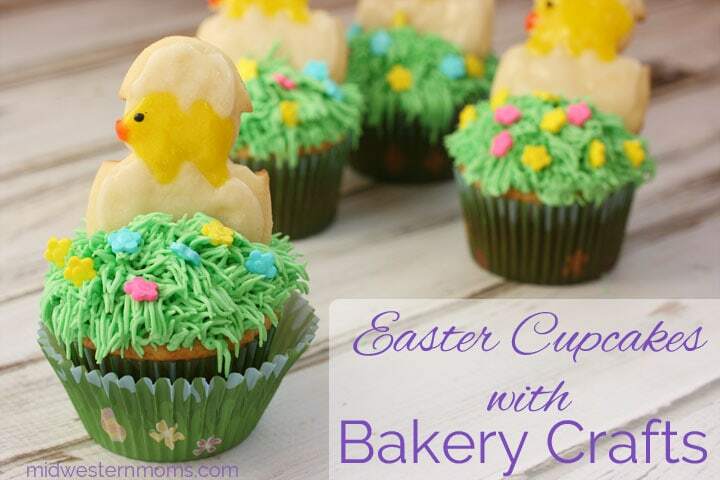 These Easter Cupcakes are made with the help of Bakery Crafts Cookie Cupcake Decorating Kit. They are fun to make and taste great too! This past weekend, I decided to have my three-year-old son help me out in the kitchen. We made some Easter Cupcakes with a fun Hatching Chick Cookie Cupcake Decoration Kit from Bakery Crafts. We had so much fun! My son was in charge of adding all the dry ingredients when they were needed for the cupcakes and cookies. His eyes just beamed because he was “Mommy’s Big Helper.” I am so happy I was able to brighten his day. 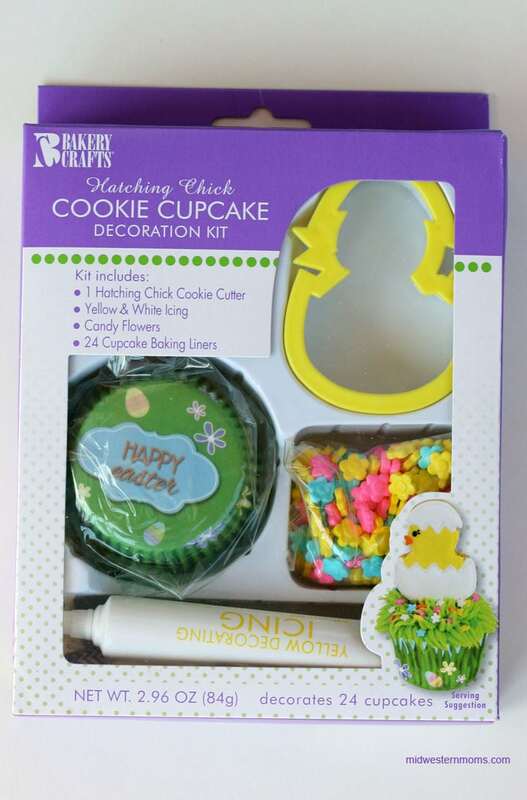 Easter Bunny Cookie Cupcake Decorating Set – This set is similar to the Hatching Chick except the set is bunny themed. You get 24 cupcake liners, bunny cookie cutter, candy sprinkles, and two tubes of icing. 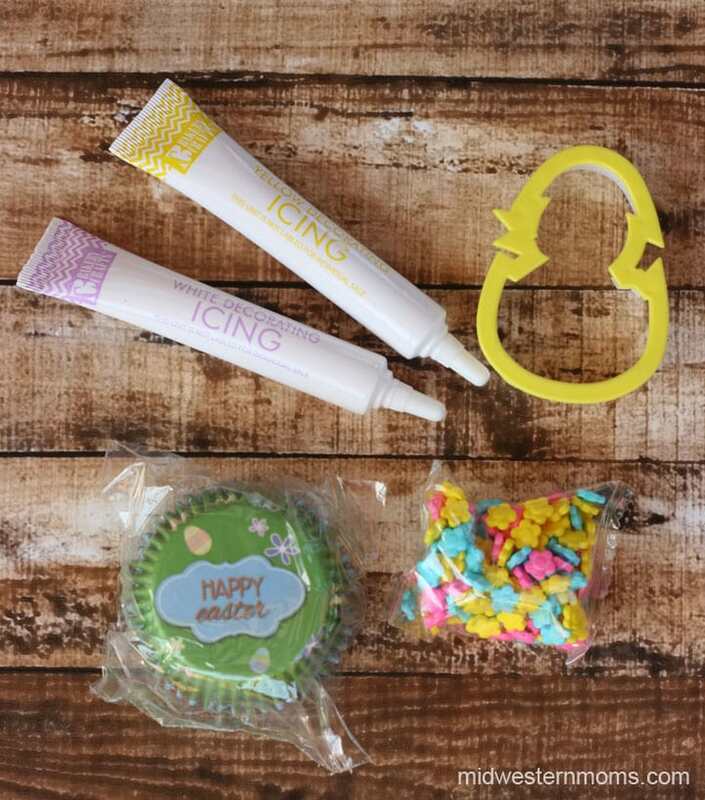 Easter Cake Decorating Set – This set is to top off your Easter cake. It comes with one banner and three Easter-themed toppers. Bunny Tail Icing Decorations – These are a cute editable bunny tail to finish off your cupcakes. You can get these decorating sets at select Walmart stores. They can be found in the Easter Holiday aisle. The only items you will need are your cupcakes and the frosting for the cupcakes. As a suggestion, I would grab some more Bakery Crafts White and Yellow icing for your cookies. If you want to get fancy, get some black for the eyes and orange for the beaks. I used a sugar cookie recipe for my cookies. When they were cool, I used the icing provided in the kit to cover them. Make sure to knead the tubes before opening to mix up the icing. The small tubes are perfect for small hands if your kids are the ones handling the cookie decorating. When attaching them to the cupcakes, cut a slit into the top of the cupcake. Then you can slip the iced cookies into your cupcakes. Make sure to frost your cupcakes after applying the cookies and top with the super cute candy flowers. On the decorating, my son added the flowers. Or, I should say the flowers that didn’t end up in his belly made it to the tops of the cupcakes. The decorating kit made things easy for us. I didn’t have to gather several different items to finish off our cupcakes. It was very nice to have it all in one package. The Bakery Crafts Decorating Kit helped make our day together special. 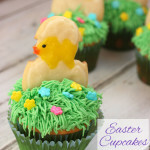 Cute cupcakes perfect for Easter! In a large bowl, mix all the ingredients until they are well blended. Insert the cupcakes liners in your cupcake tin. Fill the liners with your cupcake mix. Allow to cool before adding the cookies and the frosting. Add your food coloring gel until you get the color desired. youre so creative. Love this! These cupcakes are too freaking cute! I’m sure that mine would look crazy but I want to try using the kit! These are absolutely adorable! Stopping by from the SITS link up! i love the colorful flowers growing in the grass!